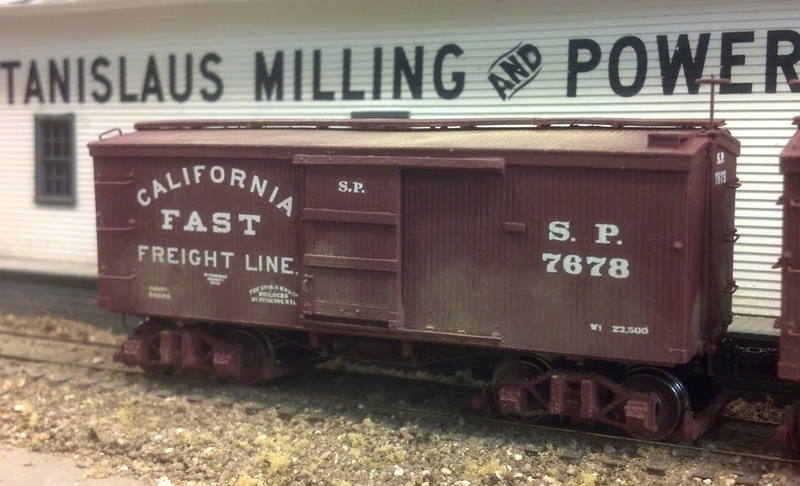 Two of the CFFL cars sit in Oakdale awaiting a shipment of grain. I chose to weather the cars a little heavier than normal since they would be fairly old and due for rebuilding. As I had mentioned in my last blog post (Bridges and Boxcars), I have been working on ten resin boxcar kits. This morning, I put the finishing weathering on them. With the exception of one car, they are all lettered for the Southern Pacific and the California Fast Freight Line. The CFFL was one of many fast freight lines formed in the days following the Civil War. In those early days of railroading, shipping numerous items by rail became problematic due to transshipments due to gauge differences and other factors. The fast freight line was set up to allow shippers to group their items in cars which received expedited services. Of course, an additional fee was charged for this service. Merchants' Despatch was one of the first of the lines followed by the Union Line, Empire Line, Red Line, Blue Line, White Line and other colors of the spectrum. In all of these, several railroads furnished cars to the line and received income based on their participation. The CFFL included the Central and Southern Pacific, the Union Pacific, Rock Island, Milwaukee Road and the Chicago & Northwestern. By the late 1880s, improvements in rail service led to the disbanding of most of these lines including the CFFL. By 1891, the SP had started to rebuild their cars to include air brakes and more modern (for the time) safety appliances. This included repainting the CFFL lettering to the large circular SP herald. Of course, all of this took time and, in 1895, there were still numerous CFFL cars on the SP roster.These show up in many photos of the era, enough so that I wanted a representative number of cars on the S&C. Decals for the cars were a combination of Art Griffin's CFFL set and ones using my own artwork. Griffin also has sets for the CFFL cars of the UP, C&NW and CM&StP and they are definitely worth the price. The cars were built from Silver Crash Car Works SP boxcars which are well-made and go together easily. Unfortunately, they are no longer available from SCCW but may be on the used market. The trucks were the swing-motion Allen trucks used by the CP and SP and still available through Shapeways. I used Reboxx wheelsets for the trucks which worked fine. The trucks are fairly fragile and do not endure much flexing to insert the wheels. They do, however, glue back together easily with CA adhesive. Couplers are Kadee 711s. For anyone interested in more information on the fast freight lines, see Railroad History No. 141. 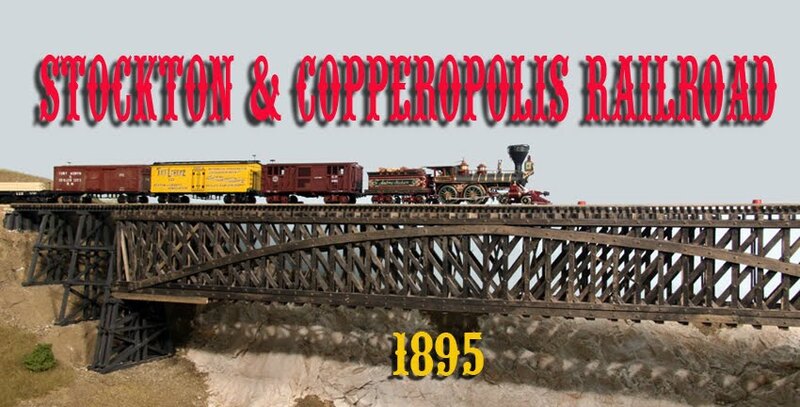 RRH is a publication of the Railway Locomotive & Historical Society (www.rlhs.org) and is a great railroad history magazine. That issue has an article entitled "Origin & Growth of Fast Freight Lines" by William W. Chandler. The article was initially published in 1889. John H. White's book The American Railroad Freight Car also has some good information.